I had always wanted to bake a double chocolate tart (chocolate for the crust filled with chocolate). I made the chocolate crust for quite a while already and hasn't really get down to do it. Finally, decided to make way for more "fridge space", I did the chocolate tart. Two special small chocolate tarts for my children. For the big chocolate tart, I added Bailey's Creme Caramel into the chocolate. I would supposed it would be nicer with some alcohol. 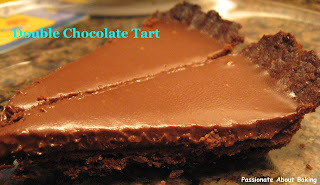 Cross section view of the chocolate tart. Recipe of the tart extracted from Simply Anne's. I had an order for an orange chiffon for my colleague to be delivered on Monday. Therefore, I had to baked it today. 7" orange chiffon in a plastic container for my colleague. 9" chiffon pan for cooling. I used the extact recipe from my previous orange chiffon cake. The pan I used was too big, therefore, the cake was a bit flat! Different views of my carrot cake with cream cheese frosting. The recipe was extracted from Allrecipes, Carrot Cake III. However, this is not as good as Aunt Yochana's American Carrot Cake. Her carrot cake recipe is much better. Allrecipe's carrot cake is a bit crumpy, the cake doesn't really stick together, whereas Yochana's carrot cake is moist & good. As for the cream cheese, I combined both their recipes. I followed Yochana's sugar amount and added a tsp of lemon juice. I omitted the chopped pecans for the cream cheese frosting. 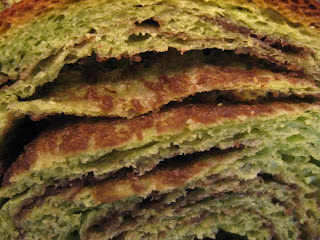 I failed several attempts trying to bake chiffon cakes, be it pandan or other flavours. Since I had about 3 egg whites in the fridge, thought of trying orange chiffon cake again. I chose Yochana's recipe. Baking one 9" & two 3" tube pans. I used the lowest rack. One of the mini chiffon cake. Very nice brown. The 9" chiffon cake. Very nice & even on the surface. Turned the 9" chiffon cake upside down. Also very nice brown. The holes on the chiffon cake is rather even. "Do-Re-Mi" sizes of my orange chiffon cakes. I'm very satisfied with the quality of these chiffon cakes that I baked. It's very fragrant and refreshing, due to the orange taste. I added orange zest too! Recipe is extracted from Yochana's Orange Chiffon Cake. (1) Whisk all the ingredients (A) together. (2) Pour (A) into (B) and mix till smooth. (3) Whisk egg whites with cream of tartar till foamy then gradually pour in sugar and whisk till stiff peak. (4) Scoop a third of egg whites and into mixture (2) and fold them together. (5) Pour the mix in (4) into the remaining egg whites and fold them thoroughly and quickly. (6) Pour into a 9" tube pan, and some remaining batter into a 3" tube pan. (7) Bake at 180c for about 45mins or till cake is cooked through. Smaller tube pan will take about 20-25mins. (8) Overturn cake (still in the pan) onto a wire rack and leave it to cool down completely. (9) Remove cake from tube pan and slice. Note: Can reduce the egg whites to 5 nos. My sister ordered some 80 mini cupcakes for a function. Here is what I made according to her requirement. Made some extra regular cupcakes for my sister. Roll it up like a swiss roll. Put both of them into the loaf pan for further proofing. Recipe extracted from Florence, 65C Black Sesame Loaf. 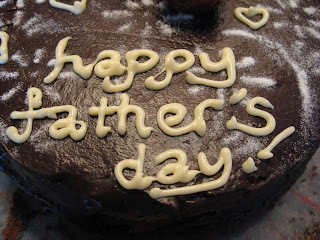 I did two cakes for Father's day, one for Saturday and the other for Sunday. Layering the cake... adding raisins that has been soaked in rum. The different layers of the cake...including a dacquoise layer. This is the decor of my Rum & Raisins Chocolate Cake. See the number of layers of my cake. Centre is the dacquoise layer. Includes chocolate ganache, chocolate mousse, raisins and of course, cake layer! 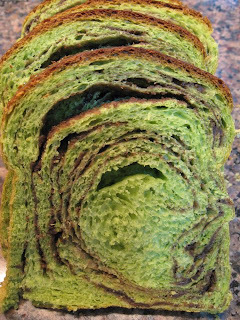 I just had to re-do this Green Tea Red Bean Bread again. The last time I did, I didn't let it proof long enough. So now, I take my time to let it proof. I also baked it as a loaf, instead of buns. Brushed it with egg yolk before baking. After the second proofing. 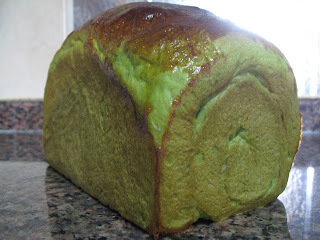 Green tea bread loaf after baking. The side is nicely rolled up like a swiss roll. 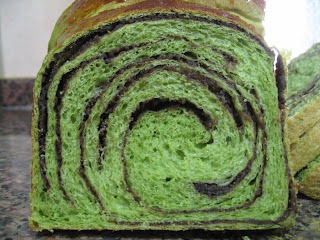 while this is another pattern on the other of the bread! As I rolled up the dough a few times, the red beans are folded a number of times. Close up on the red bean paste. Recipe extracted from Happy Home Baking. Still at home today recuperating from a bad throat. Gets better today with the medications. Did some mis en place, meaning "preparation is everything." Item 1: Japonaise Dacquoise. This is to prepare for my cake sometime later in the week. Left overs are piped as Japonaise cookies. Item 2: Chocolate Tart Dough. Adapted from "Rocky Road of my dreams". Item 3: Buttercream. Adapted from Yochana's Buttercream. No real baking today. Cannot see the end products today. During my "maidless" venture, I did the coconut ice cream, which turns out to be very good. 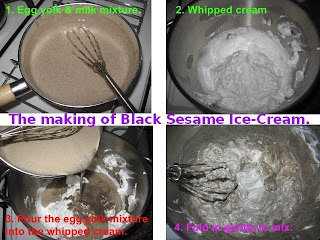 So now, I use the same recipe for my Black Sesame ice cream, with some modifications. Sequence of making the mixture. Pour them into a container and freeze it. This is how creamy & beautiful the ice cream turns out to be! Original recipe extracted from Yochana's blog. This is my modified version. (1) Whisk egg yolks and sugar till white and creamy. (2) Double boil the egg yolk mixture and stir constantly. Pour in black sesame, coconut milk, full cream milk and continue stirring until mixture is hot but not boiling. (3) Remove the milk mixture from heat and set aside to cool. (4) Whisk whipping cream till fluffy and fold in the cooled milk mixture. 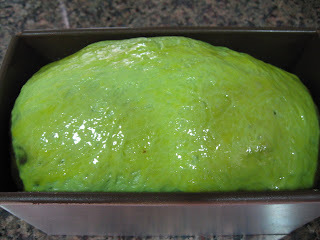 (5) Pour into container and freeze overnight or until firm.